Helambu is the nearest trekking destination from Kathmandu valley. It lies within the Langtang National Park. The cool breeze amidst the lush green forests is the highlights of the Helambu. Moreover, among origin people mostly live in this area giving you an opportunity to experience the authentic Mongolian locals of the region. The Melamchighyang and Tarkeghyang take you to another level while trekking. The monasteries and gumbas on the way make you spiritual as ever. The local water mills, chirping birds, hustling and bustling rivers and peace of Himalayan terrain, lakes,waterfall, ice basin, culture, people, flora, fauna, and rivers. We assure you to have the hassle free organized tour guided by the expert team of Sherpas and Local nature makes your trek in Helambu region spiritual and vibrant trekking experience. Join the team of Backpacker to encounter this great all. Be the part of Backpacker bandwagon and witness the Nepalese Wilderness with the difference. Pack your bags; Backpacker is here for all the trekkers. The most striking feature is the contrasting climate, terrain, flora to be found here within a close proximity. The trail could begin in a tropical forest and by evening put you in the middle of a freezing alpine landscape. 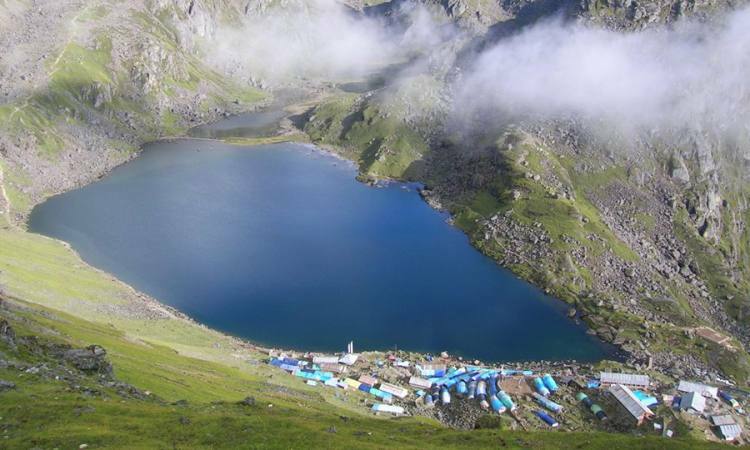 The sacred lake of Gosainkunda is one of the chief lures here. The Hindu faithful come to worship the numerous shrines of Lord Shiva in the area. Great views of Langtang Lirung (7245m), Ganesh Himal (7146m) and Dorje Lhakpa (6990m) peaks are the reward for the trekkers. The language, culture, and dress of the Helambu Sherpas are very different from the Solu Khumbu Sherpas. Accessibility has created an influx of tourist, making Helambu a popular tourist destination. Day 01Arrival Kathmandu &transfer to hotelUpon arrival at Kathmandu, Backpacker Expedition Treks Pvt. Ltd will be your trustworthy travel companion until you depart for your home country. We will accommodate our valued customers in the three-star hotel in Kathmandu. We take care of the room and breakfast of our valued customers during their stay in Kathmandu Valley. Day 02Kathmandu valley sightseeing Touring of world Heritage sites in Kathmandu valley including, Kathmandu Darbar square, Swayambhunath Temple, Boudhanath Stupa and Pashupatinath Temple. Day 03 Drive to Sundarijal and trek to Chisapani (2300m) Duration: 4 and Half hours After Having breakfast, we will drive to Sundarijal (1350m.) by private car nearly one hour and hike to Chisapani (2300m.) it takes about four hours. The unpaved way from Kathmandu turns into a trail close a small hydroelectric plant. The path will enter through the Shivapuri Watershed and Wildlife Reserve. The first Village we will come across is Mulkharka with Tamang comunity. The trail go heads down the ridge through a forest of oaks and rhododendron to Chisapani. Day 05 Kutumsang to Tharipati (3650m) Duration: 5 hours trek to Tharipati it takes five hours.The way climbs above Kutumsang on a steep, eroded trail mostly through fir and rhododendron forest where there are no permanent settlements in Tharipati.The trek keep continue north up the Yurin Danda ridge and outstanding views of the mountains. Day 06Tharipati to Tarkeghyang (2743m) Duration: 5 hours trek to Tarkeghyang and it takes five hours. The morning part of the trek walk down until you cross the Melamchi stream.and rek gently up to Tarkeghyang crossing through Sherpa village. Tarkeghyang is a nice and beautyful Sherpa comunity with one of the big and old monasteries. Tarkeghyang, also popular as the Helmu caste. Day 07Tarkeghyang to Shermathang (2621m) Duration: 4 hours trek to Shermathang it takes four hours. This day the way is more easier through flat land with green forests on the way. You trek on passing some rivers on the way. There is located a beautiful settelement on the half way to Shermathang.Shermathang is next beautyful Sherpa village where you can visit many ancient monasteries. Day 08Shermathang- Melamchi Pul Bazaar –Kathmandu, 4 hrs hike and 3 hrs drivewalk down to Melamchi Pul Bazaar along with a lot of Sherpa houses and take a car to Katmandu. Day 09Departure to final Destination (Farewell)We always feel very sad at this very juncture that our companion of trekking for the moment ends here and in the meantime we also feel relaxed that we were able to serve you with the best trekking experience that you ever get in your lifetime while trekking. We would leave no stone unturned to make your customers feel important and happy. We always take suggestions and encourage our valued customers to promote Nepal and Trekking in Nepal.